Today, I am giving over my entire Friday LinkFest post to an important issue that I was reminded of this week: protecting Alaska's Bristol Bay. I want to thank my StockTwits pal Brian Shannon (@alphatrends) for bringing back to my attention this ongoing threat to one of the world's greatest resources up in my old home of Alaska. 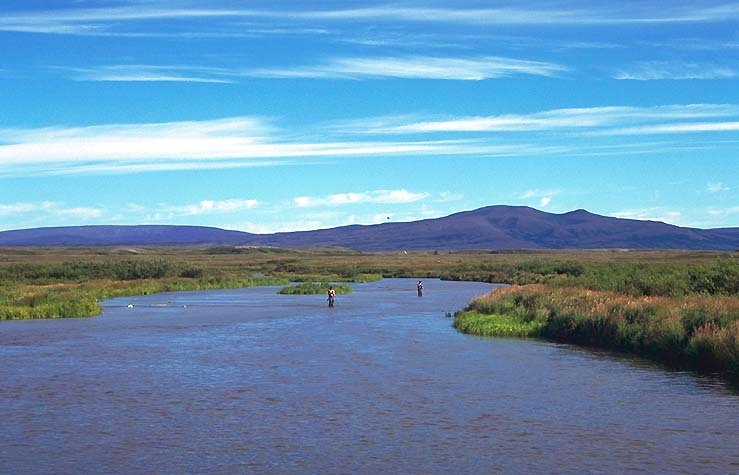 Back in the 90s, I worked with The Nature Conservancy on a deal to protect a significant stretch of one of the greatest fly-fishing streams in the world, Lower Talarik Creek, in the Bristol Bay area in Alaska's southwest. Bristol Bay is America’s richest salmon fishery and the heart of a $2.2 billion regional fishing industry. Amazing indigenous rainbow trout grow to significant size in Lake Iliamna, which is fed by the 55-square mile watershed of LTC and other streams in this 1.1 million acre fish and wildlife habitat, and then follow the salmon into the waters during spawning season. A proposed a large-scale, open-pit, copper-gold-molybdenum mining operation threatens the watershed of the most productive salmon rivers in the world. "The people of Alaska came close to blocking the project themselves in a 2008 referendum," according to a New York Times editorial this past Monday. "Three former governors, including two Republicans, and Senator Ted Stevens spoke out against the mine. Industry, however, spent $12 million on advertising about the mine’s economic benefits; that, plus a last-minute pro-mining push by Gov. Sarah Palin and her administration, turned the tide in industry’s favor." The EPA has announced it will make an assessment of the risks to the bay from mining and other commercial projects. 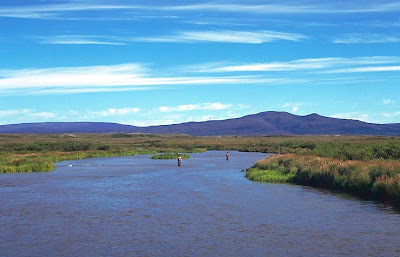 Here's a link to a National Geographic story on Bristol Bay, to an appeal by the outfitters Orvis, which was a contributor to the Lower Talarik Creek project, and Trout Unlimited's Save Bristol Bay site. The Nature Conservancy also has some great resources on the importance of Bristol Bay, including a great selection of Salmon Ecosystems and Mining research and a story about the fight from 2009. Environmental Leader reported last week that Zale Corporation, along with 54 other jewelry companies, with a combined $5.75 billion in annual sales, have pledged not to use gold from the mine. "Gold will not be the mine's major product," according to the project's backers reported in EL. "The mine will offer 80.6 billion lbs of copper, 5.6 billion lbs of molybdenum, 107.4 million ounces of gold and commercially significant amounts of silver, rhenium and palladium." The Pebble Partnership was set up by Anglo American PLC and Northern Dynasty Minerals Ltd, to promote the benefits of the project, including the potential for jobs and production of precious metals to meet global demand. While I recognize the need for precious metals -- copper is of particular importance to the green technologies we feature here on The Green Skeptic -- it is unclear whether a project of this size can be developed in a way that will ensure the long-term natural, economic, human, ecological and traditional values of this area.